The first step of any journey is to decide where one should go. Creating a plan for how your current resources can help you to your vision. Just as each stone in a cobblestone path is individually inspected, measured, sharpened and placed, we look at each aspect of your plan and work to arrange everything to fit properly and provide a solid result. Any path can fall into disrepair if it is not inspected and maintained from time to time...and provide assistance if new goals, changes in resources or something of the unexpected occurs. Building a path is not a product of happenstance. Rather it is the result of understanding, planning, and expert implementation. 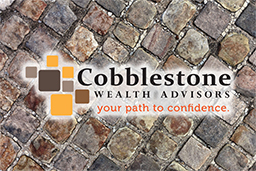 Cobblestone Wealth Advisors are here to guide you through each step along your path to confidence. Starting with a discussion about you, your family, and your goals, we can begin to sketch out an idea for your path and create a plan to build.